Kamalia et alia | a resto shaman and "her sisters and her cousins and her aunts"
I like everything in this set except the chestpiece and leggings. So when I get it, I’ll wear it with some alternate chestpiece and leggings swapped in. 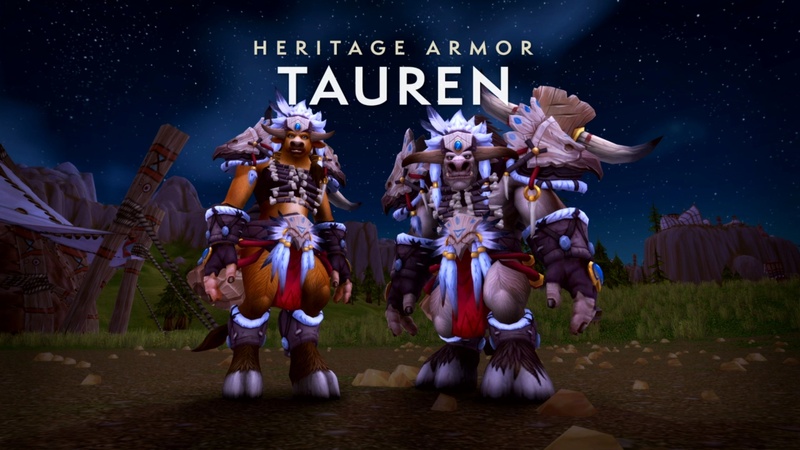 One of these months/years, I’ll manage to get my Highmountain Tauren Druid, Void Elf Mage, and Blood Elf Mage leveled and get their Heritage Armors, too. As for other schtuff from the Patch 8.2 infodump today, the piece of mount equipment I am most excited about is the Barding. I can deal with falling damage, I don’t use my Waterstrider by default so I’ll still just use it when I actually want to do some serious waterwalking, but getting dazed and knocked off my mount when I’m just trying to get from here to there drives me nuts. I finished the 8.0 part of the War Campaign. Now I need to find out what’s up with Saurfang and go run Atal’dazar so I can continue finding out what’s up with Vol’jin. When I’ve completed The Fate of Saurfang and The Shadow Hunter, I’ll do the 8.1 part of the War Campaign. Getting to Revered with Champions of Azeroth is now the only thing I have left to do for Battle for Azeroth Pathfinder Part 1 — in the past week or two, I’ve gotten to Revered with all the other BfA factions. So when I saw a Champions of Azeroth contract on the AH for relatively cheap, I decided to get it. I think I’ll continue to use Champions of Azeroth contracts until I’m Exalted with Magni. Then I’ll do Zandalari contracts (if I’m not already Exalted with them just from Emissaries by then) so that I can do the Zandalari recruitment scenario and see Talanji’s coronation. For someone whose playtime is as limited as mine has been this academic year, there is a wealth of BfA story content to do! Apparently only three new outfits to show off is too small of a collection for a Sunday Mog Show — after I’d gotten all the screenshots taken for the first three kits shown here, I decided to go ahead and make the fourth one, too. A decade ago, when I was first beginning my journey in Azeroth, after creating our Tauren Shaman & Druid and playing with them for awhile, BTH and I thought it might be fun to create a pair of Alliance characters, too. We decided to make Super Stealth Buddies: he made a male Night Elf Rogue, and I made a female Night Elf Druid. That character was named Kivrin, after the protagonist of Connie Willis’s excellent Doomsday Book. We didn’t have as much fun with our Night Elves as we did with our Tauren, however, and eventually Kivrin got pruned from my growing alt roster. I reassigned her name; given the Black Plague setting of Doomsday Book, it seemed more appropriate to give the name Kivrin(ne) to a Forsaken character. Kivrin now returns as a Feral-specced alter-ego of Kerithian. The original Kivrin had this hairstyle and color. She also had the “shadow” tattoo style that Kerithian now wears, but to further differentiate the two characters (because I’ve kept the skin tone and face the same), I’ve changed her tattoo style to the “blades” design that matches the markings on the face of the Night Elf Cat Form. Following the destruction of Eversong Woods, Silvermoon City, and the Sunwell by Arthas Menethil, and the rejection of the elves by Garithos of Stormwind, it seemed to Kaelydia a good idea to follow Prince Kael’thas and his new allies, Illidan Stormrage and Lady Vashj, to Outland. When Kaelydia observed the devastation of Farahlon caused by the construction and ignition of the manaforges, however, she began to doubt the Prince’s plan for providing his suffering people with the supply of mana they needed. She was not alone in these doubts, of course, and when Lord Voren’thal defected to Shattrath, she was among those who went with him. Karolissa had been wanting a “Quel’dorei” outfit using the blue and silver recolor of the Sunfury Bow of the Phoenix. This week it was my major mail-wearing characters’ turns to get new outfits. Because Kamalia had already quested all the way through Zandalar, Kjerstin could don a full set of Kul Tiran chainmail before even setting foot on the fabled island nation. From the set name, this must be the version acquired in Drustvar. I love the plaid-patterned padding under the leather and mail in this armor design! Ketura had been wearing her previous outfit for a rather long time, but I hadn’t had any inspiration for a new kit. So I took her to the Trial of Style, hoping that I might come up with something worth keeping. I threw this outfit together for the “Tabard Time” theme, and it won the round. I sent Kaelyla to the Trial of Style to pick up the Season 4 cloth set. The theme of her last round was “Epic Purple”. This kit started with the helm, shoulders, and boots, and then I had to figure out what went in the middle. A collection of Transmogrification Kits actually worn in-game by my Blood Elf Paladin. Outfits are listed from most recent to least recent. Items that are no longer obtainable are marked with an asterisk (*). A collection of Transmogrification Kits actually worn in-game by my Blood Elf Mage. Outfits are listed from most recent to least recent. Items that are no longer obtainable are marked with an asterisk (*).